That's why they are called Chocolate and Vanilla Chinchilla! Can ChinChoclies's cone GET any bigger?! They also live in an ice cream Cone House (see in background left of puzzle). No thirty one flavors for these chins-- they only want TWO! Go figure. I guess they are purists. Maybe one day they will be bold and try chunky monkey or chinchilla gorilla flavors? Only time will tell. Hope you enjoy this cute cartoon picture of silly chinchillies..
What's the SCOOP? 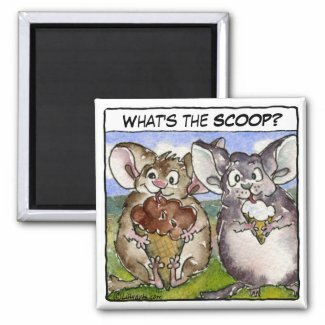 cartoon ice cream magnet and other cute personalized gifts. Send this cartoon chinchillas jigsaw puzzle to a friend as a jiggy free ecard greeting. Get creamed with cartoon ice cream chinchillas Vanillas and Chocolate in free jigsaw puzzles to play 012. If you would like to vary the CUT OF THE PUZZLE click on the shapes button, you can alter the cutout jiggy shapes and change the difficulty of the puzzle to give yourself more of a challenge. Some of the cuts (shapes) are incredible! Very fun crazy ones. Some really hard! There is a built in timer if you want to test yourself (and or if you happen to also be cooking eggs) When you move the pieces with your mouse, listen for the CLICK as you release and you will hear when the piece locks into place. The timer starts when you click on a game.